NEED HELP FINDING THE BEST DIET FOR YOUR BODY? Discover through a myDNA test how matching your diet and lifestyle to your unique genetic profile can lead to Nutritional and Lifestyle changes that can target disease prevention and help you achieve optimal health. The myDNA Wellness & Nutrition Test is a genetic test which helps you to make more informed health, nutrition and lifestyle decisions. 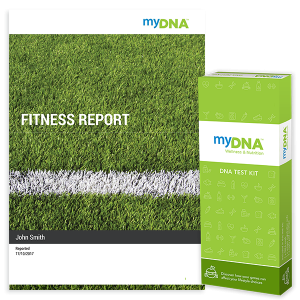 What is included in a myDNA Personalised Diet Report? The report will identify your results for seven key genes which have influence on; weight and appetite, fat storage, your risk of elevated triglycerides and your ability to breakdown fat. The report includes advice for the most appropriate diet, based on your genetic results. This recommended diet is based on scientific evidence matched to your genetic type. The report provides a food guide, your recommended nutritional breakdown and portion sizes based on your genetic profile. What the report does not provide? The report will not provide any ‘silver bullet’ solution to weight management, but will provide insights to help you make more informed decisions based on your genes. Lifestyle and environmental factors also play an important role in weight management. The report does not provide specific dietary recommendations for coeliacs, diabetics, pregnant/breastfeeding women or people with any other health conditions. We encourage our customers to take the report to an accredited dietitian for such advice. WHAT MAKES THIS REPORT DIFFERENT? This report uses genetic interpretation to explain how the body is pre-programmed to behave, therefore making it personalised to the customer. The Diet reports are compiled and reviewed by myDNA’s expert team which includes sports dieticians, clinical geneticists, medical doctors and pharmacists. HOW DO I PREPARE FOR DNA TEST? To ensure accurate results of DNA testing, please do not eat, drink, chew gum or smoke 30 minutes prior to swabbing. Order DNA kit via phone 03-9374-3392 or online for either pickup or delivery (within Australia). Our DNA kit includes detailed instructions on how to provide your saliva sample. Once completed, send your kit back to the lab in the pre-paid packaging provided. Note that variety in training is recommended for all people, regardless of genetic type. What does the report not provide? The exercise recommendations based on the report do not accommodate for existing injuries. We recommend that you consult a healthcare professional or your trainer to check the recommended exercises are suitable for you. The report does not factor in any health conditions that you may have, nor is it suitable for pregnant women. We encourage you to take the exercise to a relevant specialist for further advice. ARE YOU ON THE BEST DIET FOR YOUR BODY? myDNA Wellness & Nutrition is a genetic test which helps you make more informed health, nutrition, and lifestyle decisions. The test analyses 7 genes that can influence your diet and weight. A personalised report is then sent to you which provides recommendations and advice on diet, exercise, and nutrition. Some people are built for speed. Others are built for distance. myDNA fitness test analyses 7 genes that can reveal your unique body type and help you to find the best sports and exercises for you. DO YOU LOVE COFFEE? OR DOES IT KEEP YOU UP ALL NIGHT? • Included with all Diet, Fitness and Diet & Fitness bundle kits.